Until recently, the existence of a two-million-year-old tree had been suggested only through fossil records. Then, one September day in 1994, a parks officer was bushwalking through an isolated canyon in Australia’s Wollemi National Park when he happened on some ancient-looking trees that he did not recognize, some up to 40 metres tall. The “extinct” tree, which scientists have since said likely dates back as far as 200 million years, was very much alive. The discovery was compared to finding a living dinosaur. A plan for the recovery of the “Wollemi Pine” was started and material for its propagation was released worldwide in 2006. 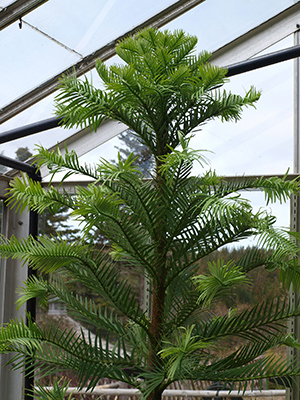 This spring, visitors to the Memorial University Botanical Garden were treated to the big reveal of one of these rebounding “dinosaur trees” after seven years of coaxing a small, scruffy-looking donated sapling into a vigorous, healthy specimen. Botanical gardens have long been associated with showcasing the exotic, as well as the pretty. But the Wollemi Pine story shows that they are also playing an important role in preserving the Earth’s biodiversity against challenges such as climate change and habitat destruction, while capturing the public’s attention in order to broaden interest and knowledge about why biodiversity matters. More than just an object of fascination, Memorial’s Wollemi Pine is being used as a teaching tool for groups of schoolchildren learning about the natural world and conservation. There is no standardized definition for what makes a botanical garden, but the hallmarks are that the plants are labelled and documented, the garden is open to the public and has some kind of scientific and/or educational program. An arboretum is similar, except it is dedicated to the collection and display of woody plants (trees and shrubs). Click the arrows to see images from some of the universities’ botanical gardens. A sample of the University of British Columbia's Botanical Garden. The University of Alberta Botanical Garden. The Université Laval Botanical Garden. The University of British Columbia's Botanical Garden. As teaching and learning institutions, universities seem a natural fit for hosting botanical gardens. Universities of 16th-century Italy are credited with developing some of the earliest versions. These “physic gardens” focused on the study of medicinal plants, in the days before modern pharmacology. Several contemporary Canadian university botanical gardens, in tribute, have set aside space for similar plantings, along with spaces featuring plants used by Indigenous peoples for their own medicines and food. Queen’s University in Kingston, Ontario, had one of the earliest Canadian botanical gardens, set up in 1861 by the Botanical Society of Canada for the study of botany, but it lasted only a few years. These days, there are fewer than a dozen botanical gardens and arboreta among Canadian universities, mirroring the country’s limited share of these gardens generally, compared to the U.S. and Europe. The University of British Columbia Botanical Garden is the oldest. The garden was established in 1916 by B.C.’s provincial botanist, “Botany John” Davidson, on the university’s Point Grey campus as part of his mandate to research the province’s native flora. It has since earned an international reputation, with 50,000 catalogued plants representing 5,000 types, and has the largest collection of Asian plants in the country. “We are very fortunate in that we have this unique ecosystem and climate here that allows us to grow temperate plants from anywhere in the world,” says Patrick Lewis, the garden’s director. Most of the country’s other university botanical gardens began out of a similar drive for a living laboratory to support learning and research. The University of Alberta Botanic Garden, with 2,500 different plant types, was established on donated land in 1959 as part of the department of botany. Memorial’s garden, also with 2,500 plant types, was initiated by its biology department in 1971 in a corner of Pippy Park in St. John’s. Preparing the site for opening required hauling out old cars previously junked in its four-hectare Oxen Pond, now home to a pair of breeding osprey. The University of Saskatchewan’s Patterson Garden Arboretum was started on university land in 1966 as one of several federal government sites testing the prairie hardiness and adaptability of various trees, shrubs and vines. The government ended its research in 2001, but Patterson carries on the work. Every university botanical garden dedicates special effort and space towards the conservation of native plants, especially those considered threatened or endangered. Most, if not all, offer an Index Seminum (Latin for “seed list”), a free-of-charge exchange of documented plant seeds among botanic gardens worldwide. Beyond a friendly way to add to each other’s collections, the system provides vital global insurance against loss of plant species and varieties. Growing threatened native Ontario trees, in part to create seed that can be shared, is one way the University of Guelph Arboretum goes beyond being a “tree zoo,” says director Shelley Hunt. “The ultimate goal is to have it all back out on the landscape.” That’s what the arboretum did recently when it provided blue ash seed to tree nurseries doing restoration work in the wake of the emerald ash borer, which is currently decimating North America’s ash populations. Blue ash, while rare, appears to have greater resistance to the beetle than other types of ash trees, a good example of why it’s so important to conserve as many genetic expressions of a species as possible. The most valuable seeds are those gathered in the wild and identified by where they were found. UBC’s is the rare university botanical garden that has the money, thanks to a five-year anonymous donation, to carry out overseas identification – in this case, the collection and conservation of endangered, endemic plants in the mountains of northern Vietnam. Done in partnership with that country’s Academy of Science and Technology, the project uses a drone developed at Université de Sherbrooke to not only scout above the treetops, but also to collect botanical samples from plants in this biodiversity hotspot. “There’s so much there, we could probably go back every year for the next 20 years and still find material,” says Douglas Justice, the garden’s associate director of horticulture and collections who has taken part in the expeditions. But it is also a race against time. Local people still cut down trees for everyday needs such as fuel or building material, and motorcyclists are commonly seen driving the roads with chainsaws in their baskets. Habitat loss due to human development is a worldwide problem. Most university botanical gardens pay special attention to the research aspect of their mission, providing support for researchers in their own academic community and beyond. Researchers at Memorial are using the botanical garden to study bird mating behaviours through birdsong. The U of A’s garden hosted research into canola plants and chickadee feeding this spring and has been the backdrop for research into improving child health through nature-based physical activity. Acadia University’s Harriet Irving Botanical Gardens is one of many that maintain an experimental area, with faculty researching the propagation of plants native to the Acadian forest region using seeds from the garden’s seed bank. Université Laval’s Roger-Van den Hende Botanical Garden is among those gardens providing research facilities and support for private industry. Memorial biology professor Luise Hermanutz calls her university’s botanical garden “integral” to a nearly 20-year provincial project to recover several threatened plants found uniquely on the windswept limestone barrens of Newfoundland’s northern peninsula, where human activity such as gravel pit extraction has taken its toll. Besides growing a willow from the area, Memorial’s garden collects and freezes the seeds of other rare, tiny flowering plants called Long’s and Fernald’s braya that researchers like Dr. Hermanutz are trying to repopulate. At a time when there’s growing emphasis on experiential learning, botanical gardens also allow students and faculty to truly get their hands dirty. Dr. Hermanutz teaches her students about trees in the Memorial garden’s boreal forest: “Students love getting out there.” More than 30 undergraduate classes at U of Guelph incorporate the university’s arboretum into their curriculum, from biology to fine arts. Laval students head into their garden for hands-on learning about photography, entomology, biology and plant diseases. These programs help gardens boost their relevance on campus, especially since most are located some distance away from the main buildings. The gardens also build bridges to the surrounding communities. “We’re out there at least once or twice a week. The beauty of that garden is just how many plants there are,” says Princeton Lim, a Vancouver physician who walks UBC’s garden regularly with his wife. U of A’s garden runs an educational program for 17,000 schoolchildren each year that usually sells out. On top of that, the anticipated opening of U of A’s $25-million Aga Khan Garden, gifted by the spiritual leader of the world’s Ismaili Muslims, is expected to more than double attendance, from 75,000 to 160,000 annually. The 4.8-hectare garden will have traditional features such as running water and reflecting pools, filtered light, geometric patterns and exquisite scents – nearly every plant will have a fragrance. “There’s nothing like this in North America. It is spectacular,” says Ms. Swanson. The university hopes the garden’s official opening will take place in 2019, while construction is expected to be completed this year. All those visitors can also be important to the bottom line. Admission fees (some gardens are free), facility rentals for weddings and conferences, educational workshops, donations and gift shop sales are typical revenue sources for gardens that rely on more than their universities for their budget – which is most. That’s pushed them to get creative. Memorial’s garden drew 14,000 visitors last December for its holiday lights festival, in addition to a Halloween “Boo-tanical” garden event featuring poisonous plants, and a popular “Game of Gnomes” evening, where visitors search the garden for hand-crafted gnome homes. This article could also mention the Morgan Arboretum, located on McGill University’s Macdonald Campus in Ste. Anne de Bellevue. This is great to see! The use of trees and other plants on university campuses as teaching tools for students and for the general public is a great idea, expressed well in the many university gardens and arboreta listed in the article. Sadly, my own institution has waxed and waned on this idea when raised by myself and a fellow botanist in my Department, and to add insult to injury we have recently had to fend of a predilection within admin to remove as many trees as they can! A minor and quite academic quibble; the use of ‘types’ in the article mirrors the common usage of ‘variety’ when referring to plant species and reflects common usage. Neither is really applicable when discussing true botanical gardens as these are designated as such because they label the species of each tree, shrub and herbaceous plant, along with the ‘variety’ of any species when applicable (VIU’s Milner Gardens recently established a ‘species garden’ for Rhododendrons to make this very point). Species is not equivalent to ‘variety’, and ‘type’ has a very specific meaning when used in botanical gardens and botanical science. Thanks for the fascinating exploration of the important work of university botanical gardens. Their vital roles are too often misunderstood, forgotten or ignored. In reference to Victor Chisholm’s comment: the Morgan Arboretum is mentioned in a sidebar about university arboreta included with the print version of this article. It’s wonderful to see universities like McGill maintaining these great green spaces for so many to enjoy. Great article! I’d like to add that through the ArbNet Accreditation Program (launched in 2011) we have accredited 245 institutions worldwide of which 25% are colleges or universities. ArbNet fosters the establishment and professionalism of arboreta; identifying arboreta capable of participating or collaborating in certain scientific, collections, or conservation activity; and advances the planting and conservation of trees.